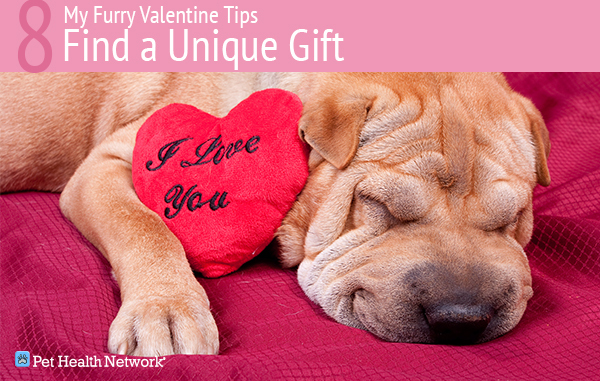 We're looking at 12 unique ways to show your pet some love this Valentine's Day! Everyone knows that Valentine's Day is in February, but what you may not have known is that National Dog Biscuit Day is in February as well! 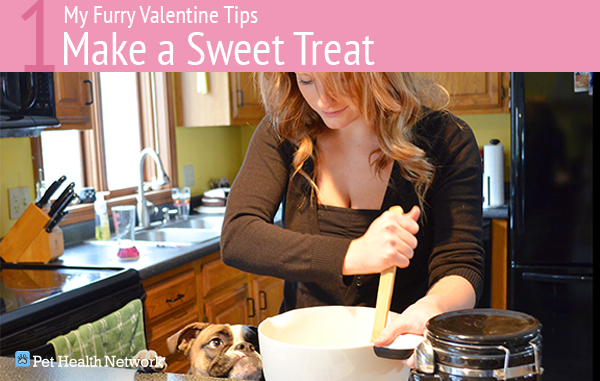 Make your dog a special treat by following this easy recipe for Beef and Bacon Pupcakes. 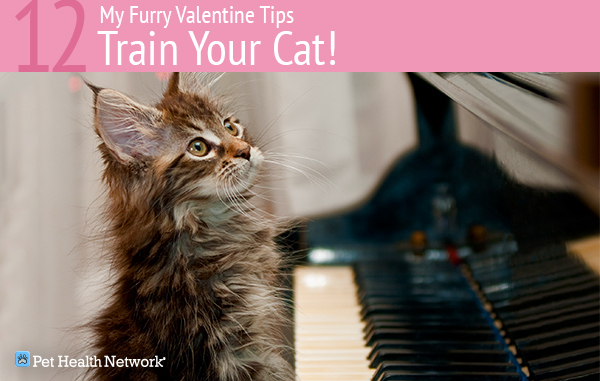 And don't forget about your feline friends- they like treats too! Petfinder.com has some other fun treat ideas! If you're going to heap the sweet treats on your pet, be sure to make up for it with lots of exercise and a dental checkup. Here are some great ways to keep your pet slim and trim, and be sure to check out our top dental tips for dogs and cats, too! 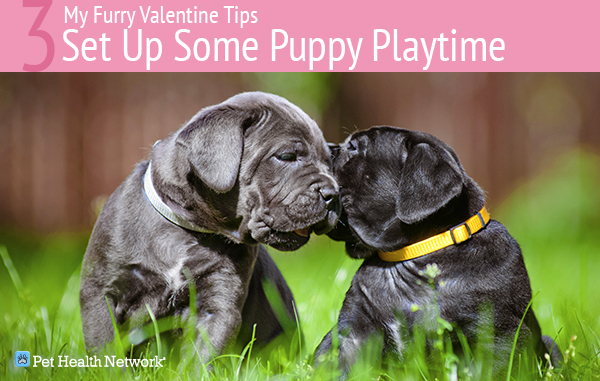 If you don't have any plans for the big day, make it a big day for your pooch and invite another friend's dog over for their very own puppy play date! Does your dog or cat love plush toys? 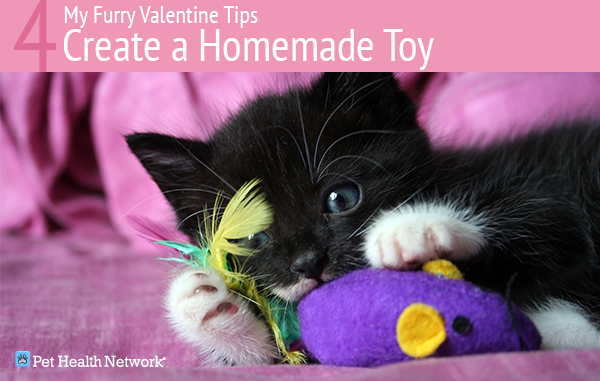 Make your own cat toy following these instructions, or put your own twist on it! 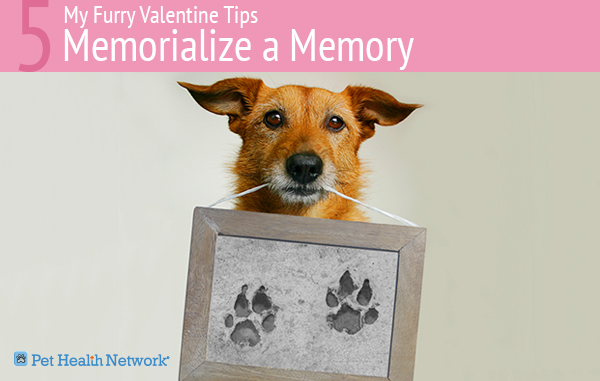 Get a nice photo of you and your pet together, OR, make a permanent mold of your pet's paw as a forever keepsake. Here is an affordable kit! Let your pet get creative! Grab a poster board, your favorite animal safe and washable paint colors, -- making sure they don't contain any benzoyl alcohol, henna, or xylitol -- and carefully dip your pet's paw into the paint. Make sure they don't lick the paint, but if they do, bathe them just to be on the safe side. Then let them paint how much they love you! When finished wipe off their paws or give them a bath. If you notice any reactions to the paint, wash it off immediately with Dawn. 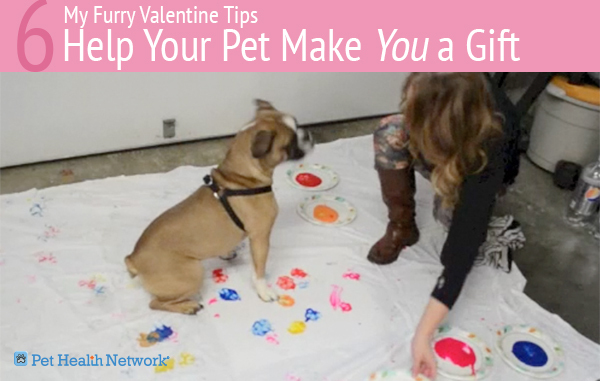 Click here to watch the video of my dog, Harley, painting her love! Dogs and cats should always wear collars and tags, but what if your pet gets loose with no collar? 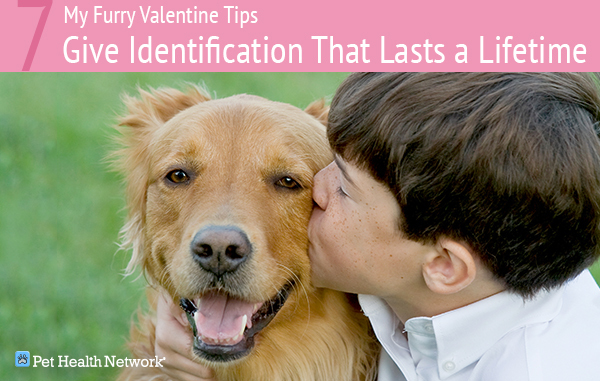 This Valentine's Day, give your dog or cat the gift of permanence with a registered microchip. It's a simple identification chip that your veterinarian puts underneath your dog or cat's skin allowing shelters, rescue groups and other veterinarians to identify your pet. Learn more about the advantages of microchipping. Looking to spoil your pet with more traditional gifts? You're not alone, according to Buisness Insider Americans will spend an estimated $815 million this year on V-Day gifts for pets and you can find some great -- if at times ridiculous -- options on Etsy.com. If you can't find what you want through Etsy's Valentine's Day pet section the Amour de la Mer Dog Collar is a steal at $899,000. 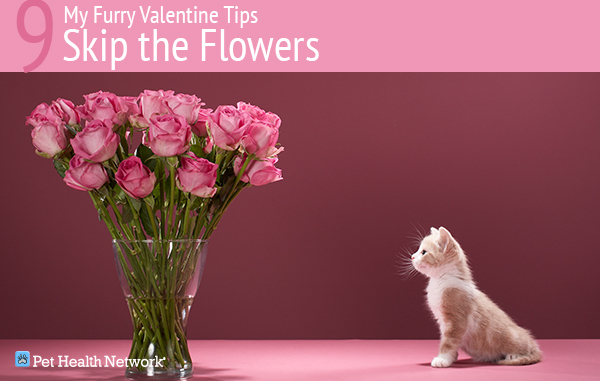 Especially these flower species that can be deadly to cats. Ok, this really isn't something to give or do with your pet, but we're sure she'll love avoiding an upset stomach -- or worse! Your pet gets a new best friend and you get to save two lives: the pet you bring home and the new pet that the shelter can take in. It's a win-win-win! 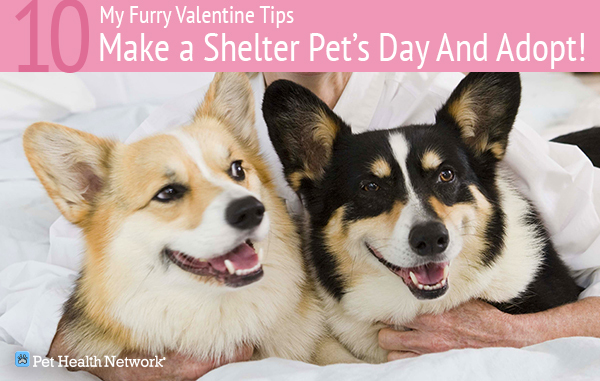 Better yet, think about adopting a senior pet on Valentine's Day! 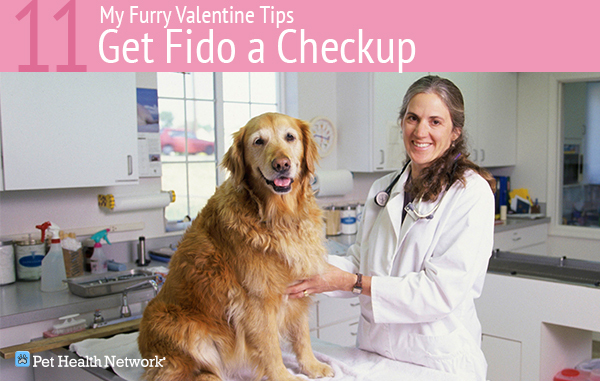 Taking your pet in for a routine checkup and catching problems before they get worse is one of the best ways to show your pet some love this Valentine's Day. 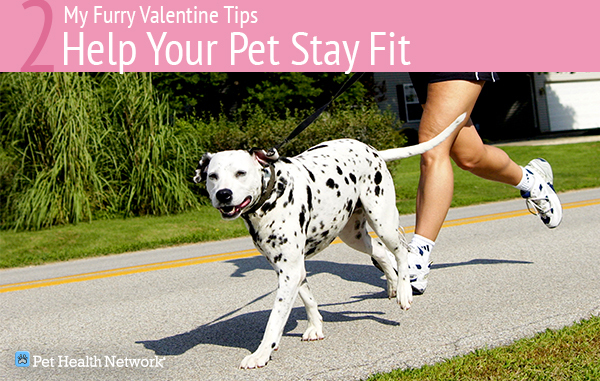 After all, you're saying you want Fido around, happy and healthy for as long as possible! Dr. Ruth MacPete can tell you all about the importance of checkups. Dogs aren't the only pet you can train! Cats get bored too. Stimulate their brian by using a clicker and food rewards to teach tricks ! Don't forget the catnip.